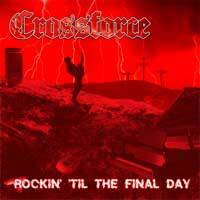 Crossforce were a traditional, 80's-style, Christian heavy metal band from San Francisco, California, USA formed in 1986. They recorded and released a six song demo in 1986. Though they only released 500 copies, the tape became well known and saw heavy circulation in the old tape trading circles. The band played at the infamous Metal Martigras with bands like Vengeance, Malachia and Deliverance in 1987 and seemed to be gaining some momentum. ("Our Father" and "Rockin’ Til The Final Day" were also featured on the Metal Mardi Gras video from 1987.) In that time, however, the band recorded a live demo tape that was never released to the public, but only used as a demo for Frontline Records, which Crossforce were obviously hoping to sign with. However, within a year they were gone from the metal map. Being that Crossforce never were afforded the opportunity to record anything but demos, the sound quality here certainly isn't top notch. The guitars tracks are obviously not doubled so they lack the power that they could have had, if recorded properly. However, the overall sound certainly isn't bad either. Those like myself who grew up in the 80's watching their buddies garage bands strive for the prize will certainly be able to appreciate the raw sound of Crossforce. It's nice that 20 & 30-something years later, labels like Roxx and Stormspell are putting out these old, long-lost demo tapes in digital format. "Rocking' Til the Final Day" was released as a 2-CD set for the first 100 orders. The second disc features live tracks from a previously unreleased Crossforce show recorded in San Francisco in '87 as well as song long lost demo tracks from the band Mercy, which was Tony and Phil's post Crossforce band. These demos and all of the live tracks have never been released. These bonus demo tracks are actually quite good and probably as good, if not better, than the main disc. The live tracks aren't bad for what they are, but the six demo tracks on disc two are definitely worth searching out the 2-CD version. The 2-CD version also came with a red signature Crossforce guitar pick. Those who pre-ordered the CD also received a free promo poster.